Click 'Add' button to add audio files, or click 'Open List' button to import track information directly from a CUE file. Also, you can just simply drag & drop the files to MP3 Splitter Pro window. MP3 Splitter Pro supports to load track information from a CUE file as well as load a audio file directly. If loaded successfully, the information (such as title, artist, album, length) of the audio file will be shown in split information box (the box just below the split list). For CUE file, all tracks will be automatically added in the split list as well as track information (title, performer). Now, you need to add time points you'd like to split at. Select the audio file or split group you'd like to insert, click 'Insert Split' button to add the time value in the left side box as split points one by one. You can leverage both the slider bar and the playback functions (play, pause, fast forward) to quickly get to the time points you'd like to cut at. For more advanced ways, please refer "Advance Way to Locate, Update Split Points"
If you want to split to equal segments, please refer "Split to Equal Segments"
- You can quickly set split parameters to all audio files in a split group, such as switch split mode, split special, save list, edit ID3 tag, etc. - You can enlarge the dialog window to view more information of the tracks you've added in the split list on the screen at one time, and to be could be much convenient to move the slider bar. - You can save your current work at any time to a CUE file and load it back later (please note that the overlap setting of tracks can not be saved to the CUE file). If you just want to split some of the tracks in the the split list, please uncheck the tracks you don't want. Click ''Start Split' button and choose the target folder. Once completed, all the split files will be saved in the folder you just selected. Import track information - you can import the tracks to split from CUE (*.cue) file. Click 'Open List' button, select the file to import. Once done, the tracks will be automatically added in the split list. Export track information - you can export the tracks in the split list to CUE (*.cue) file. Click 'Save List' button, export the tracks in the split list to the file you selected. Same as the standard version. Click here to view. 'Split by Silence' is useful to split a single audio file to separate segments/songs by automatically detecting the silence between the segments. 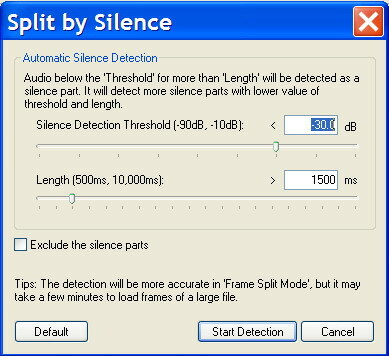 You can either select a single audio file, or select the entire split group in the split list to apply the silence detection. To launch 'Split by Silence', click the 'Split Special' button and select 'Split by Silence ...'. Exclude the silence parts - if you don't want to include the silence in the split audio file, please check this option. Once done, click 'Start Detection' button to perform the detection. The detection is more accurate in 'Frame Split Mode', but but it may take a little bit more time to load frames of a audio file. You are able to switch split mode of a single audio file or the entire split group. Fast Split Mode - it is fast but sometimes the split position might be a little bit difference than the actual. Frame Split Mode - it is more accurate by reading MP3 frame by frame but but it may take a few minutes to load frames of a large file. MP3 Splitter Pro uses 'Auto. Detect' mode by default, which will analysis the audio file you just loaded and then automatically select the best split mode for you. If you just want to quickly split to some smaller pieces without much concern about the precision of the split point, please select 'Fast Split Mode'. By default, the naming rule is "%G\%F-%S". By default, each splitting sections you added will have the same ID3 TAG information as your source MP3 file. Just double-click the audio file or split group in the splitting list, a MP3 ID3 TAG editor window will be lunched. For example, if you want the 'Title' of each track could automatically include the track number, you can append '%K' in 'Title' field; or if you want to name 'Track' automatically, you can fill '%S' in the 'Track' field. Copyright © 2002-2005 EZ SoftMagic, Inc. All rights reserved.